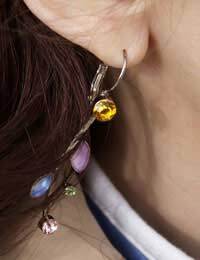 Ear piercing has been used as a method of displaying body jewellery for many years in any different cultures. Modern piercing includes using a variety of different parts of the anatomy of the ear, which can be more painful and present more risk of problems afterwards. Are you 100% sure that you want the procedure done? Will you spend the time and effort maintaining the piercing and following aftercare guidelines? Have you decided on the piercing and location the piercing is to be? There are many different areas of the ear that can be pierced, somewhat surprising for such a small organ. Traditionally the lobe is pierced as this area is thought to be less painful, display jewellery better and be easier to care for. More modern piercing sites include using the pinna, the helix, the rook, the daith and the tragus. These are all area high in cartilage content and will need greater levels of aftercare, and may well be the most painful areas of the ear to be pierced. After you have had a successful piercing, it is important that you take care of that area. The piercing will usually have to remain in situ for a period of at least 6 weeks, longer if areas of cartilage have been pierced. During this time, it will need to be cleaned daily. Using cotton wool balls or gauze pads, the area should be cleansed gently using warm water, often with an approved anti-bacterial agent added, or using the solution provided to you by the person whom carried out the piercing. Gently turn the piercing using clean and dry fingers to ensure that it is still patent in the hole, and that it is not becoming embedded or stuck.Often after a piercing, the tissues around it will swell temporarily, during this time ensure the jewel is not becoming buried in the tissue, nor let is become so loose that it will fall out. See the person whom did the piercing to adjust jewellery as necessary. As with any procedure that involves piercing the skin with a foreign body, the risk of infection is quite high. Always ensure the practitioner performing the piercing is fully qualified, uses disposable and/or sterile equipment for the task and always washes their hands before and after the procedure, adorning clean and sterile gloves when tending to you. Infections of the soft tissues of the ear, can at the least be painful and at the worst, seriously compromise the tissue, causing scarring and sometimes causing the tissue to die. Try and wear a good quality of metal or jewel in your piercing as many people are allergic or become sensitive to, the cheaper metals used in many costume jeweller. The ears are one of the most commonly pierced places of the human anatomy. If the piercing is carried out by a fully qualified and conscientious practitioner, followed by strictly followed aftercare, there should be no reason for complications to arise.